Atlanta based Director of Photography Tom Wells spent Thanksgiving this year in the Middle East with Fox Sports. 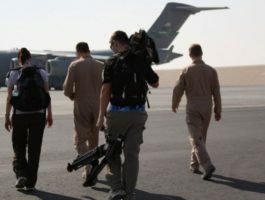 The purpose of the trip was multifaceted and included a live broadcast with U.S. troops from an undisclosed location in Southwest Asia on Thanksgiving Day, as well as shooting several taped segments for airing throughout the next year during events to include the Superbowl and Daytona 500. Tom and the Fox Sports team flew to the Middle East the week before Thanksgiving to begin preparation for the live broadcast during the Saints/Cowboys game. “It was an extremely rewarding experience,” said Tom. “We were able to experience a little slice of life that our troops overseas go through on a daily basis, and spending the holiday with them was an honor and something I’ll never forget.” A few of the segments have already aired on Fox Sports and are available for viewing on FoxSports.com. Be sure to tune into this year’s Superbowl and Daytona 500, as well as normal broadcasts during the Fox Sports NFL season to see more!